Hospital of Kharkiv Regional Specialized Children's Home №1. Photo: Alina Smutko. All rights reserved.Ukraine’s constitution is full of references to a decent life, but there’s no mention of a decent process of dying or death. For public officials, deaths are a mere statistic. For medics they are data which needs to be accounted for. But patients who receive palliative care at the end of their lives are left with alone with their illnesses. If there is no prospect of recovery, they are sent home from hospital – and their families are expected to take care of the final part of their lives. Vanya’s brain was damaged during birth. All Liza heard about her son’s state was a brusque “It’s bad, but we’ll pull him through”. When the neurologist came to look at him, she looked sternly at Lisa and said: “He’s a vegetable. Maybe you could put him in a home?” Nothing more was said to his parents about his condition. At most the hospital staff muttered: “Well, what do you want? That’s the child you’ve got”. Liza and her husband took Vanya out of the emergency department and brought him home. Vanya’s parents only learned about his palliative diagnosis when he was eight months old and they were at the emergency department again. The senior physician called Liza over and said: “I don’t think you realise the situation,” before explaining everything that was happening to Vanya in medical language. His mother went home and started reading about his diagnosis on the internet. The little boy squeezes Liza’s finger lightly, and the movement brings her incredible joy. Vanya can breathe by himself and tries to hold his head up. He mostly lies motionless and silent, but he opens his eyes from time to time. He is fed through a tube and every 15 minutes his parents have to switch on a suction machine to clear his airways through another tube. Liza and Vanya’s room resembles a mini intensive care unit. The room contains a machine to clear his throat, a pulse-oxygen machine, an aspirator and a ventilator in case his heart stops beating. All this was bought by his parents or donated by well-wishers. In two years, all the state has offered was massage at a children’s health centre and three free disposable nappies a week. The local paediatrician visited Vanya twice, but his condition was too complex for her to deal with and she stopped visiting. According to Vany’s medical card, of course, he has been visited regularly. In 1987, the World Health Organisation (WHO) recognised palliative care as a separate branch of medicine, and in 1998 added this kind care for children to the definition. According to WHO’s recommendations, “palliative care” is to be introduced as soon as any life-threatening diagnosis is made. In most cases, this is a question of adults with cardiovascular problems and children with neurological conditions. The philosophy behind the definition implies a certain quality of life, and the idea that if you can’t cure a patient, you can at least provide them with some help. Patients in this category should have access to a multidisciplinary medical team and a telephone hotline. There should also be hospices for those who can’t or don’t want to be at home and respite care to relieve the burden on families. 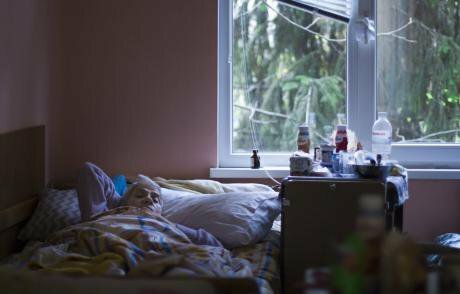 Ukraine confirmed a blueprint for palliative care in 2013, but neither national standards for this care, nor best practice guidelines, nor local treatment guidelines have yet been drawn up. For Ukrainian patients, if the term “palliative” is used, it is mainly in the context of terminal incurable cancer. In fact, the first hospice for adults appeared 21 years ago in the west Ukrainian city of Ivano-Frankivsk, long before any guidelines had been thought of. Then a hospice-type facility was opened at Kyiv’s oncological centre. But palliative care was not recognised as a separate branch of medicine, and nor was a children’s hospice built. In Ukraine, the only children’s palliative care facilities belong to children’s homes – there is one in Nadvirna in the Ivano-Frankivsk region, for example, and another one in a specialised children’s home in Odesa. 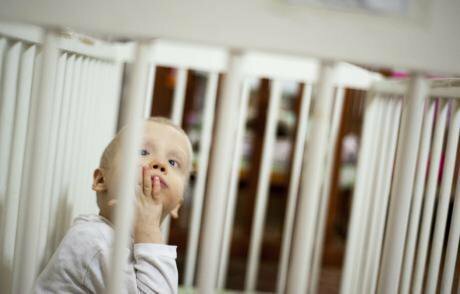 A children’s home in Kharkiv is also planning to register in the same category. Most initiatives in this area are the work of private donors. In 2015, for example, the International Renaissance Foundation provided a grant to fund the creation and running costs of children’s mobile palliative services in Vinnytsia, Kharkiv, Kryvyi Rih, Rubizhne and Lutsk. Now there is a mobile squad for adults working in Ivano-Frankivsk, and one for children in Lviv, which was set up by parents of seriously ill children. In Ukraine, people being treated with palliative care don’t even exist on paper: they are not registered anywhere and no one has tried to count them yet. The most recent statistics were published in 2017 at an international forum on palliative care. According to research by the Ukrainian Center for Social Data, one child in 30 and one adult in 100 in Ukraine is in need of such services – 255,000 children and 345,000 adults. The stats have, however, been amended several times in the last two years, depending on how they are calculated, so there are still no final figures. A hospital or a hospice? Just three years ago, few people in Ukraine had even heard of palliative care, but now the term is gradually becoming known. Uliana Suprun, the country’s acting Minister of Health, has been speaking about how, with the planned insurance-based healthcare reforms, this type of treatment will be guaranteed inclusion in state healthcare packages. The medical departments of district hospitals have started changing the signs on the doors, but not many of them have followed through on what goes on inside. So-called adult palliative care departments usually seem just like ordinary hospitals. 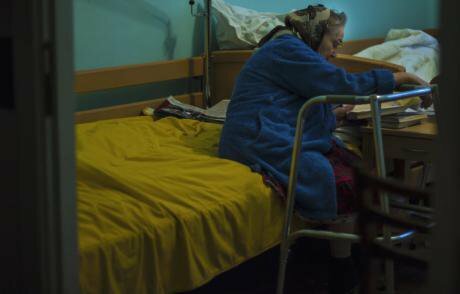 “I want to go home, but what would they do with me there?” asks a woman who has already spent a year in a palliative care, rather than an ordinary medical ward, in a district hospital in a village in the Lviv region. She is one of 17 patients there. Some of their medical records consist only of pencilled notes reading “No.5 Diet”. They spend most of their time just staring at the blue walls of their ward. None of them have life-threatening conditions, but are simply on their own or incapable of looking after themselves and need care. The safe in the supposed palliative department contains the usual opioid analgesics such as Codeine, Tramadol and morphine, but the nurse tells me that none of her patients are in need of regular pain relief, “so for the moment I do without drugs”. “But what if they die?” The nurse tries to close the subject. I’ve observed similar situations in other departments in villages, district centres and even large cities. 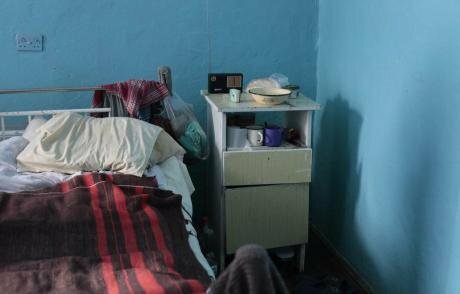 In 2016, the National Preventative Mechanism (a department of the Ombudsperson’s Office that monitors the rights of people in penitentiary facilities) carried out unannounced inspections of 15 palliative care facilities. Their report concluded that their work bore no relation to the philosophy of palliative care, and that most of their patients only required social care in care homes, assisted living facilities or their own homes. Since there are no courses in palliative care included in medical facilities’ basic training programmes, and professional development at national level is purely theoretical, practical workshops for medical staff take place, with support from Renaissance, in two training centres, in Ivano-Frankivsk and Kharkiv. These workshops are mostly attended by family doctors, but according to the organisers, they show little inclination to come, so after numerous complaints from one region, the foundation itself sends special letters to regional health authorities and organises the training sessions in local medical facilities. These training courses, based at Ivano-Frankivsk’s hospice, can last one, three or sometimes five days, and include clinical training, given by a doctor and nurse from another region. The basic training programme consists of three blocs. The first is theoretical, and comprises information on the legal framework, licensing for the use and safekeeping of narcotic substances, writing prescriptions, work with pharmacies and disposal of surplus drugs. The second is clinical: pain relief, the care of pain syndromes and dosage of analgesics; and the third is philosophical: communication with patients using role play, care for families at times of grieving and loss of a loved one and spiritual support. According to the WHO, a significant proportion of patients in palliative care are in constant pain, so the indifference of the medical profession to pain is akin to torture. Ukrainians are still used to pain: this survey has shown that only 15% of patients with chronic pain receive any pain relief. Up until 2013, it was still hard to get hold of opioid analgesics in Ukraine: morphine in tablet form wasn’t yet authorised for treatment: patients could only take painkillers if medical staff were present; a special medical committee had to authorise its use, and medics had to collect all the used capsules afterwards, to avoid police suspicion. In 2013, however, a new directive authorised morphine in tablet form, and doctors can now prescribe opioids for up to 15 days in a sufficient dose to provide relief from pain. There is no longer any need for a medical committee: family doctors can now provide painkillers, wherever they live, by issuing a prescription signed by a medical director or their deputy or the head of a health centre. And injectable analgesics can be administered by a family member, without any medical person being present. Doctors also no longer need to account for drugs they have administered: they can buy opioid analgesics in a specialised pharmacy (although there are still not many of these, especially in the regions). And anyone who can’t get out to a pharmacy just has to write a note authorising someone else to collect their prescription. Branch, who have changed their status to "palliative", but they never became. Photo: Oleg Grigoriev. All rights reserved.The 2013 reform gave Ukraine one of the most progressive European legal frameworks as far as pain relief was concerned, but it wasn’t enough – the law by itself can’t do that. Doctors are still nervous about prescribing opioid analgesics: they believe that patients should “grin and bear it”, or that the pain isn’t severe enough; or they are afraid that patients “will turn into junkies”. They also don’t want “trouble with the police, and worry that “relatives will sell the drugs”. And they don’t know how to assess pain levels, have no understanding of how analgesics work, can’t choose a drug or dosage, don’t know about the process of prescription and work on the basis of the old law. But even if an opioid analgesic is indicated, doctors don’t always prescribe the appropriate drugs, as recommended by the WHO. Problems also arise with calculating doses of a painkiller. Since Ukrainian morphine is only effective for four hours, the dosage should be prescribed accordingly, but patients often complain that, “they’ve only prescribed it to be taken two or three times a day”. Patients themselves also sometimes restrict their use of prescribed drugs, mainly out of fear of overdosing. And if adults now have access to a range of analgesic delivery, children still don’t have their painkillers in the form of syrups and plasters, as is usual in Europe and the USA. It was only in 2017 that analgesic syrup for children was registered in Ukraine, as part of the implementation of its national oncology programme. It is now available, but doctors won’t prescribe it, so you can’t find it in pharmacies. Vanya may not need painkillers yet. If something should happen to him, his parents will take him to the same intensive care department as he lay in after his birth. The hospital staff know him well, so the doctors are hardly likely to keep him in the department “just in case”. Liza is, nevertheless haunted by the fear shared by all parents with a child needing palliative care – the need to spend a long time in hospital or resuscitation. Liza has often wondered what she would do if Vanya’s heart stopped. But she knows what to do automatically; she and her husband have discussed it together and with the resuscitation specialist. While this text was being prepared for publication, on 16 April, Vanya died at home, in his mother’s arms.